The highway unrolls, a tapeworm, endless in its length. We speed west toward the hills and leave the flat valley behind. We woke up in the dark, saw the sun rise in a clear pearlescent sky, but now rain falls heavily. It doesn’t last and soon we’re in today’s start town. It’s Livermore, I think. I need a bathroom, that’s all I really know. I’m in the car today, riding with a team behind the race. I need to find the car, then find the bathroom, then make sure I don’t get left standing on the street corner when the race rolls out. I find the car. I’m getting ready to get in the backseat, forgetting for a moment that the mechanic always sits in backseat with his wheels and water bottles and whatnot. He laughs at me. I’m not really awake. I should stop now and warn you that today’s story does not involve coffee. A Pepsi appears later, but no coffee. Sorry if this news comes as a disappointment. Certainly, it did for me. The race rolls out neutral for a series of circuits around town. I make it to the bathroom, find the front seat of the car, and we’re on our way. The crowd blurs by my closed windows and ever so often my eye catches and stalls on a single person. There’s a kid waving a cow bell, a couple women chatting with coffee. Everywhere are people waving and shouting. Apparently, this bike racing thing is a big deal. Race radio comes on, and tells us that there are a few riders chasing on after mechanicals and late runs to the bathroom. The race will begin when they’re all together. Race radio is a woman, and in my head I name her Kate. I never get around to finding out what her real name is, but she’s my new besty. She speaks English and French, and each race update comes through in both languages. The race is on now, so we speed up. One of our riders flats, and we zoom up the left side. Neutral service gets there first, much to the disappointment of the team mechanic, who is sitting in the backseat. Got that? Mechanic in the backseat. He would prefer that his rider races on one of the wheels he prepared and that is crammed in the backseat beside him, but there’s no time to change now. Suddenly, race radio is very busy indeed. Two riders attack and have a small advantage. Now that attack is neutralized, and there is another attack. And it’s back together. Two new riders attack. The field reabsorbs them. One rider attacks and doesn’t get far. In the driver’s seat next to me, the team director is smiling. In every attack, he has a rider. The team’s goal is to get at least one rider in the escape today. They’re local boys and they want to put on a show for their sponsor. They’ve made the break every day so far. Odds are good they’ll make it again. Still the attacks are going one after the other, and race radio patiently rattles off the riders’ numbers each time. I write them down without much confidence that I’ll need to know them. Finally a group of six goes up the road. Race radio tells us that the field has slowed for a nature break, the universal sign that the day’s breakaway is being allowed to go free. Of course, I miss half their numbers the first time. Hey! Kate! Can you say that more slowly? I get lucky and fill in the blanks when she repeats them in French. Though the field decides to keep the escape close today, the race settles into an easy rhythm. Back in the car, it’s time for lunch. The team director takes the first bite of his sandwich, and a service call comes over race radio. The bike racers want lunch, too. It’s like watching the bike race. As soon as you get up to make a sandwich, everything changes completely. The road is barely two car widths wide and we go screaming up the left side. I hold the sandwich. They chat and pass bottles through the open window. Then it’s time to drift back into line. We roll through a stream crossing, and a rider goes through just ahead of us with his feet up high. It’s a long day for wet shoes. I hand back the sandwich, which is by now a little disheveled. He doesn’t seem to mind, which is good. I never like to disgruntle the driver. The road curves along the contours of the canyon walls. Down below, a small stream runs off the remains of the winter’s rains. The tall grasses glow tawny blonde in the sun. It’s too late in the year for green hills. Scrubby oaks stand at sporadic distances, grown from seeds dropped at random by the vagaries of the wind. They’re survivors these trees. We descend until we reach the canyon floor and follow a serpentine road. I drop my pencil at each turn of the road. The mechanic laughs at me some more and wonders if we can talk to astronauts on the satellite phone I’m carrying with me. It’s been a while since we last saw the bike race, which is well ahead of us now. On the descending roads, they’re rolling fast, propelled by strong legs and driving ambition. Suddenly, we’re back in it again. 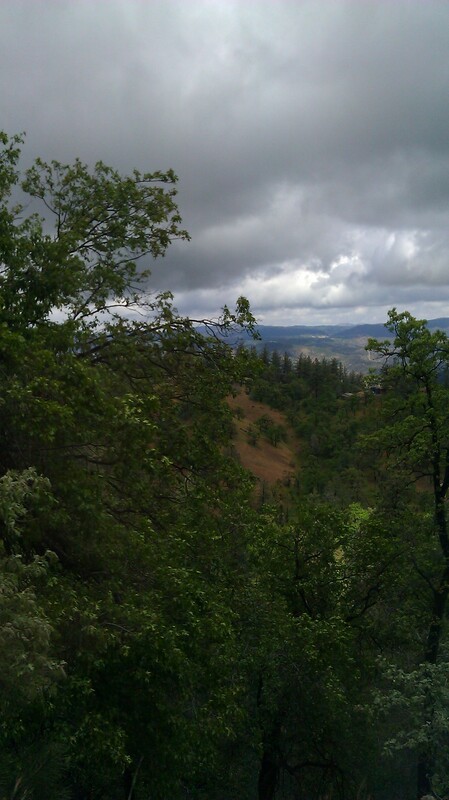 We’ve come to the base of Mount Hamilton, one of the day’s big climbs. A helicopter hovers overhead, and looking up, I can see spectators skylined along the road where it switchbacks up the mountain. 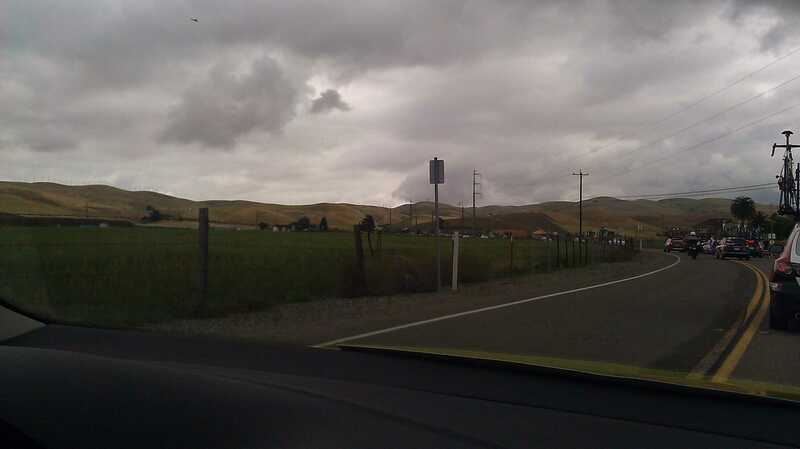 Race radio comes on again as the early breakaway shatters on the climb’s steep pitches. I can barely hear the updates over the helicopter’s rhythmic chatter. It sounds like a war movie, except in bike racing, the explosions happen silently. We drive up through the field now as riders drop off the back. We offer a bottle to a tired-looking rider from another team. He waves it off. The riders at the front are well out of sight, but we can see the consequences of their hard riding here at the back. 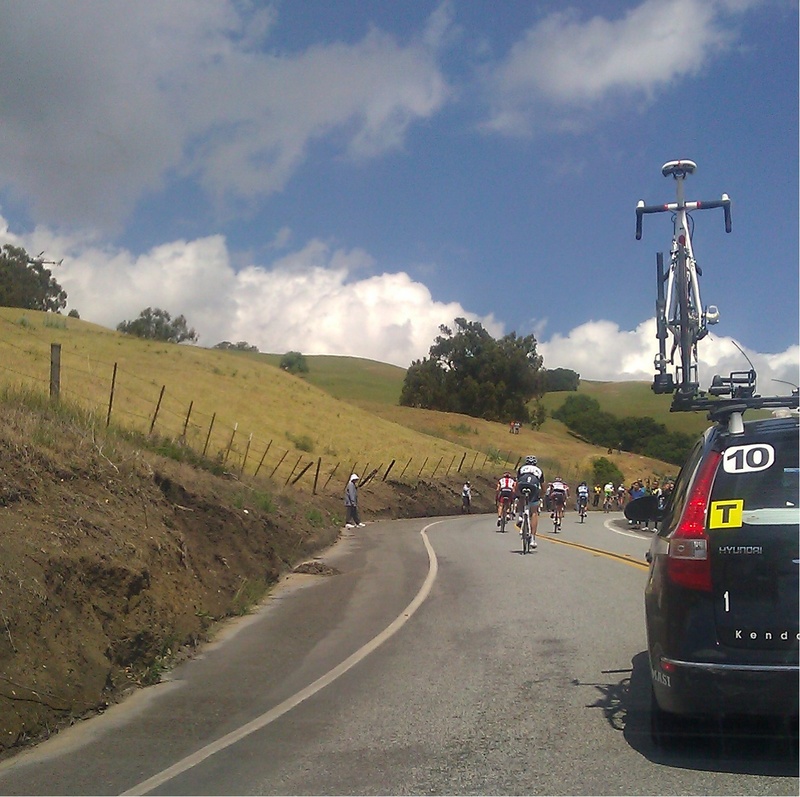 Race radio tells me who is crossing the summit of the climb, but we’re still well downslope. We’re in the bike race, but not of it. 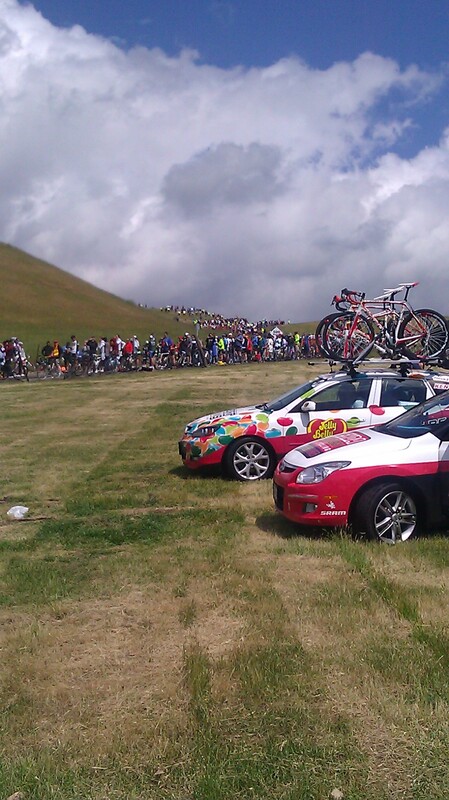 The riders pass close alongside the car, pushing the pedals with tired legs. It’s hard going at the back of the field. This is the bike race you don’t usually see on television. The car window frames the riders faces and we pass close enough to see each meter of elevation gain written in their expressions. Bike racing is a hard game. One of the riders from the team rode the early break. Now he is dropping backward through the field. We slow, and the team director hands him a bottle. Hang in there, you can get back on during the descent. The rider nods, takes the bottle, keeps climbing. It’s still a long grind to the summit. Sometimes, it’s necessary to tell yourself little lies. Soon we reach the top and pass by the white dome of the observatory. It’s time for the descent. I clip my pencils to the seatbelt and sit on my pad of paper. Anything not held down tightly flies around the car as we corkscrew down the mountain. We take the corners at speed, and it’s like the best kind of rollercoaster. It’s fast, but it doesn’t go upside down. I brace with my legs and hold on tight. The landscape dissolves into a rush of color. Riders chase between the cars, slipping through the corners centimeters from rearview mirrors. The road is tight and we’re all moving fast. There is no room for error. A Pepsi that appears in the first act must go off in the third. That’s the rule. We’re heading toward the final climb and I’m out of water. It’s thirsty work in the car with the caravan kicking up dust ahead of us. The mechanic hands me a Pepsi, and it’s the best thing ever. We pass through residential neighborhoods, the lawns gleaming green in the sun. Then, it’s on to the final climb and we slow to a crawl as the road tilts up. Soon we’re driving past dropped riders who strain against the pedals. Gravity, she is cruel. We pull along side one of the team’s riders to hand him a bottle. He gets a little pull off it and some words of encouragement. Then he’s on his own again. The slow climb gives me plenty of time to enjoy the view and I look back downslope to San Jose sprawled across the flat valley. Happy fans line the road side with cheers and cowbell. Later, as I’m walking to the finish, I run into two of my friends who scored a spot right on the finish line. We hug across the barricades. They have the best seats in the house, except maybe mine. The team cars pull off the road well short of the finish. I experience the steepness of the climb firsthand as a walk the final few hundred meters to the line. I’m in the crowds and the vibe is happy. They’ve seen some bike racing today. It’s cow pasture on both sides of the road and I dodge bikes and spectators and barricades and barbed wire as I climb to the finish. By now, most of the riders have finished and I turn around in time to see the sprinters’ grupetto roll across the line. In a stroke of luck, I run into friends who have a car at the finish, which is good, because I do need to get off this hill somehow. There are too many of us to fit really, but we make it work. The media room is in a church today, and there are pockets sewn into the back of the chairs for Bibles and hymnals. A large cross hangs in the front of the room. There’s still no coffee in this story. The minivan travels across the darkened city grid. The GPS screen tilts and shifts to represent our movement through its internal maps. There’s the real city outside and the imagined pixellated city in the circuit boards behind the screen. Or, maybe it’s the opposite. It’s much later now, and still I have writing to do. I head for the bright lights of the hotel lobby. It’s very shiny. I find a red couch in a corner. There’s an electrical outlet in the wall beside it. The internet works. Things are looking up. Loving these posts Jen! Thanks for sharing your perspective! Thanks Beth, glad you enjoy :) Always happy to give my friends something fun to read! Ok, so this is just friggin’ awesome! Thanks Jen. I really do love your writing. Fun read! Good to see you. How is it that “coffee” is not in your cloud? I don’t know. It should be! LOL, plainly I’ve been lagging at the tagging.